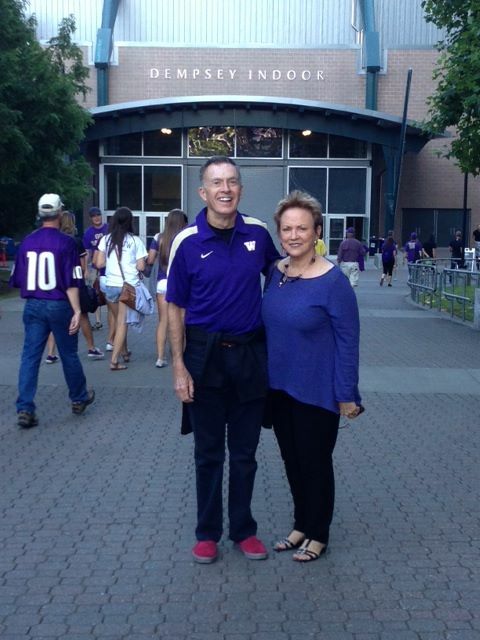 Jan and Neal Dempsey, recipients of the 2018 Gates Volunteer Service Award, have supported the UW generously for more than 40 years. When Neal Dempsey, ’64, gave the 2013 commencement address at the Foster School of Business, he donned the customary cap and gown — and boxing gloves. Neal’s speech was packed with anecdotes illustrating the principles that have long guided him and Jan, his wife of more than five decades: Accept failure, embrace change and give back. Early in his career, Neal learned those first two principles the hard way, as CEO of two companies that went out of business. After picking up the pieces, reexamining his goals and starting over, he found his calling as a venture capitalist in the Bay Area, where he has flourished. But he didn’t forget to give back. For decades, Neal and Jan have made a profound difference at the University of Washington through their philanthropy. 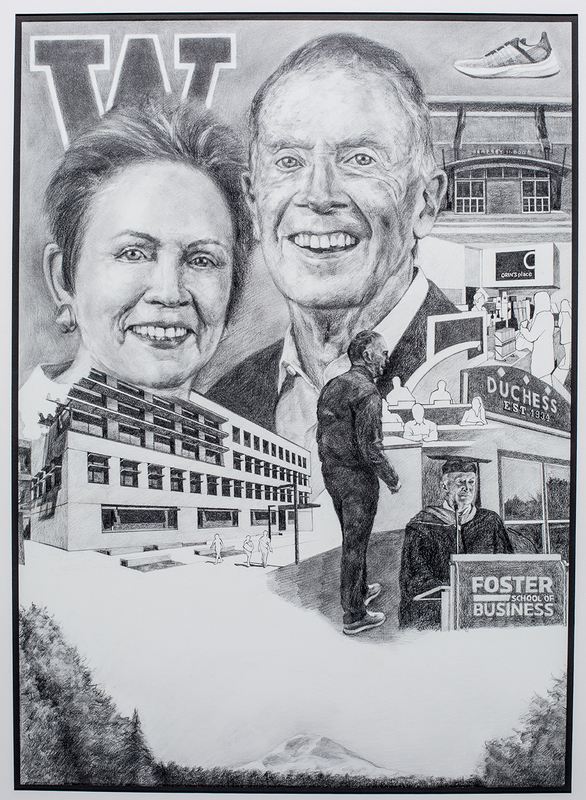 Their transformative giving took the Foster School and UW Athletics to new heights, from the cutting-edge facilities they helped build to the world-class professors, coaches and students they helped attract. By serving on numerous boards and committees and teaching a course at the Foster School, Neal also offered his alma mater the gifts of time, vision, leadership and inspiration. In recognition of the Dempseys’ impact, the UW Foundation has honored them with the 2018 Gates Volunteer Service Award (GVSA). Presented annually, the GVSA celebrates those who shape the University’s trajectory with their philanthropy and service — and who encourage others to do the same. 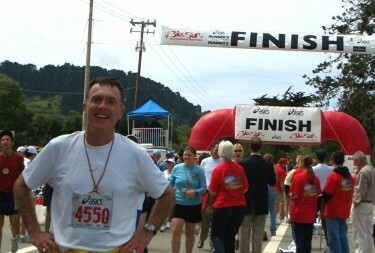 Neal is all smiles after finishing yet another marathon. “I guess it started in the late ’80s, when I got a letter from Nancy Jacob” — then dean of the Foster School — “asking me to join the advisory board,” Neal says. With the characteristic energy that has helped him complete more than 100 marathons, climb mountains and sail around the world, he dove into philanthropic service. Since receiving Dean Jacob’s letter, Neal has brought those defining traits to the UW, serving on boards and committees in the Foster School (including three decades on its advisory board) and on the UW Foundation Board of Directors; offering his expertise and mentorship to UW Athletics; taking on important roles in two University campaigns; and providing valuable guidance in dean and president searches. Neal and Jan share a moment in front of the Dempsey Indoor Practice Facility. Neal’s leadership is matched by his and Jan’s generosity. Their support created the Dempsey Indoor Practice Facility, giving student-athletes in football, softball, baseball and soccer a place to train indoors — and a home for Husky Track and Field to compete. The Dempseys bolstered the men’s and women’s crew teams with their role in renovating the Conibear Shellhouse, and they brightened fall Saturdays for thousands of fans with their crucial contributions to the renovation of Husky Stadium. At the Foster School, the Dempseys’ philanthropy was essential to the construction of PACCAR and Dempsey halls, the heart of the business school. Drawing inspiration from his startup roots, Neal was a champion and co-founder of what would become the Buerk Center for Entrepreneurship. “We built this school to be a real winner, a big program,” says Neal of the Foster School. He’s also thrilled by the UW’s excellence in athletics (anyone who’s been to a game with him will tell you he’s an animated fan), but he and Jan are the most motivated by the people whose lives they’re impacting. Through scholarships in football, tennis and golf, the Dempseys help student-athletes succeed both inside and outside the classroom. At the Foster School, they have created a fellowship for MBA students and an undergraduate scholarship in entrepreneurship and innovation, and they have endowed positions that help the UW recruit and retain top faculty. “The support we give professors helps them do more research and advance their careers — those who get support are very deserving, and the same goes for the students,” says Neal, who lights up remembering the many students he’s counseled and mentored. 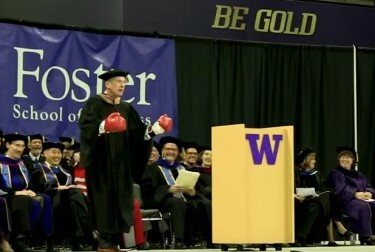 Recently he co-taught a class on CEO and board leadership for the Foster School’s MBA program, traveling from San Francisco to the UW every week during spring quarter. “It was exhausting but rewarding,” Neal says. He managed to juggle the class, his full-time job and a commencement speech for the Master of Science in Information Science program. The Gates Volunteer Service Award is presented annually by the University of Washington and the UW Foundation to recognize and honor individuals whose long-term volunteer efforts of time, service and philanthropy have encouraged others to similarly support the University of Washington. Recipients of the Gates Volunteer Service Award exemplify the highest standards of service to the University of Washington, modeled by the singular vision and generosity of the William H. Gates family, whose volunteer service, commitment of time, and philanthropy continue to advance the work of the UW in profound and enduring ways. Read more about the Gates family’s support of the University of Washington. First presented in 2002, the award follows the tradition of the long-standing UW Recognition Award, initiated in 1976. It is one of the most distinguished accolades bestowed by the UW.